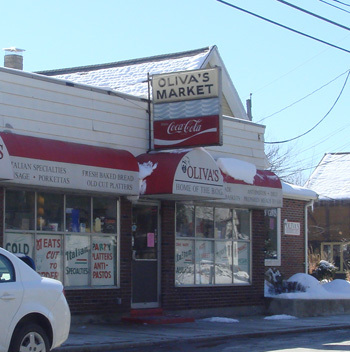 Oliva’s Market in Milford, on Rt. 16/ E. Main St. (even their website doesn’t give an exact street address) is a place that I know has been around for a long time because I’d go by it all the time but never went. 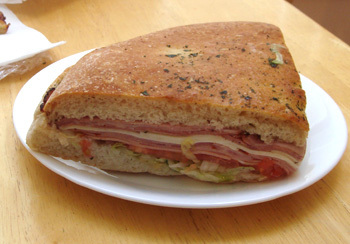 I heard that they have great Italian sandwiches, even one that is their signature sandwich called the B.O.G. so I went in to get on and see what it was like. First I’d like to say that this an awesome little neighborhood shop that has anything you could want in Italian deli and foods. They have a refrigerated and frozen section of home-made foods, sauces and soups, even pasatelli noodles to add to your own soup. 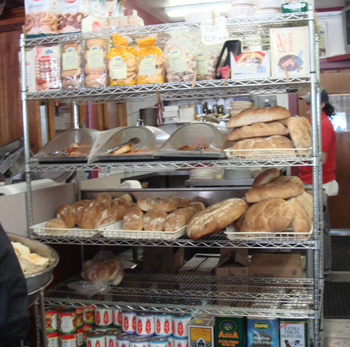 They also have fresh breads and pizza slices that is self serve. I brought a B.O.G. 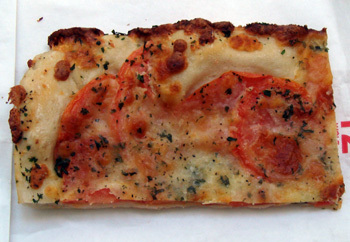 and slice of pizza to my mom’s since it was on the way and she likes Italian sandwiches too. They use fresh focaccia bread that is unbelievable and the combination of meats and cheese with whatever dressing they use is awesome. This is a great sandwich and perfect for sharing. Here’s a slice of their homemade pizza which was excellent as well. 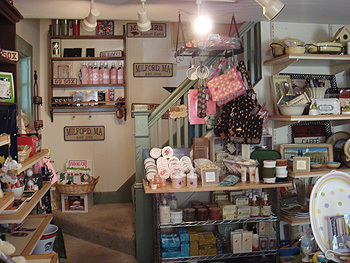 They also have a little gift area in the back full of all sorts of homey gifts. Oliva’s is such a great place, I can’t believe I missed out on this for so many years but I’ll be back to try more of their goodies! Oh, you’ve found a gem. Everyone in my family loves the food there. There’s plenty of ready-to-heat soups and dinners in the refrigerator too. They’ve catered several parties that I’ve attended and never disappointed. As long as you’re in the neighborhood and supporting local businesses – there’s a wonderful Portuguese market closer to the center of town on the same side of the street. Nice meats, specialty foods and those terrific Portuguese breads – and the spiced sausages (like chourico) are worth the trip alone. Thanks Michelle, I followed you from your Framingham blog. Actually the sandwich you show here is a G.O.G. – the B.O.G. is on a 1/2 loaf of Vienna bread. The B.O.G. has tomatoes and onions only, no lettuce like the G.O.G. I’ve been going to this market since I was a baby, and have many fond memories of the people that have worked there over the years. They make unbelievable gourmet gift baskets…I especially like to send them when people have new babies or a death in their family. It’s so much nicer and more personal than flowers. One of my favorite dishes is the penne with broccoli and chicken – it’s in a garlic olive oil and it’s the best. The margherita pizza is yummy for lunch and they have great sandwiches in their hot deli – chicken caesar and the steak and cheese are two of my favorites. 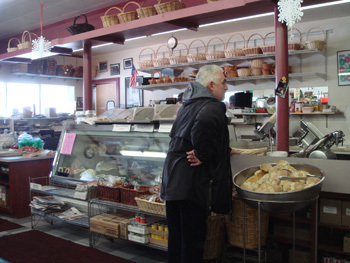 You can NEVER go wrong stopping at Oliva’s. People drive up from the Cape to go to this place!